So often we embrace some aspects of our lives while trying to resist others. We judge what we feel is “good” to feel and seek more of it, then we shun the parts that do not fit. This puts us at the mercy of our external environment and causes us to ignore our internal one. We become seeds on the breeze when we are un-rooted in the full experience that the spectrum of life has to offer. Our emotions are the dashboard upon which we can navigate through our troubles, yet so often we allow them to consume us. They are just part of the experience. 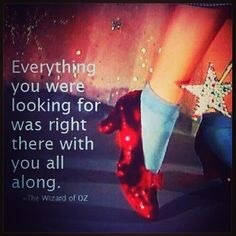 Blocking out part of our emotional spectrum through judgment is like turning off one of the colors of the rainbow. We then begin to feel incomplete and unwhole. This shame blocks our personal power and growth. Rainbows represent the light spectrum in all of its component parts. They can also represent for us hope, for a rainbow needs both rain and light to be seen, often born after the storm. I like to think of rainbows as the sun’s gratitude for the rain. Rainbows can also represent a return to childlike innocence, trust and the belief in miracles. The belief that everything really is going to be okay (and already is), despite the seeming difficulties we face. How can we each embrace another aspect of ourselves today? Why wait for every aspect of your life to be okay before you can allow yourself to feel happiness? Why wait for those last dreadful pounds to lose their grip on your hips to feel alive inside? Why wait for the perfect mate, leaving so much of your life to someone else’s fate, before embracing yourself and all that you are? Why wait until you have lost your health, your mind, or your mate to truly live? Give yourself permission today to envision and then live, starting on the inside, the life you are here to live: one of connectedness and creativity ~ a life that is internally (and eternally) free! When we want to create a change in our lives, visualization can be a very helpful tool. 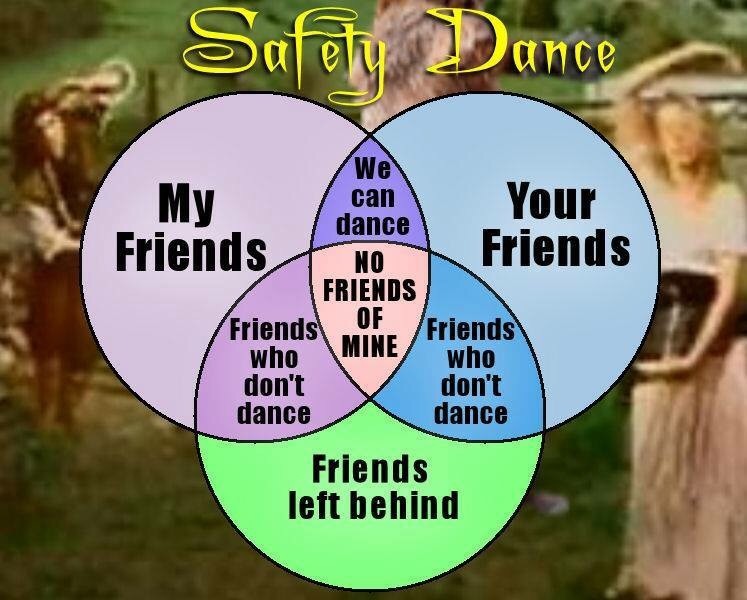 Yet we also need to use some precautions, too. I often remind my physical therapy clients, “Just as marathoners see themselves crossing the finish line, it’s important for you to visualize what you want to achieve.” If one cannot see the goal as achievable, then the goal probably won’t be met. Some of my chronic pain patients also suffer from depression. So I ask them, “what do cheerleaders say to help athletes perform better? Tell them they’re doing great or that they’re doing things terribly wrong?” Be your own cheerleader, please! It’s so hard to make a change if you’re drowning yourself in negativity. Just as if you were driving to an unfamiliar destination and find yourself lost: stop, reassess, then try a different route. Beating yourself up just keeps you making wrong turn after wrong turn (4 left turns make a circle, not a right!). Many research studies have shown that visualizing performing well helps to improve performance. Furthermore, those whose practice is both physical and mental outperform those who only practice physically or mentally, according to this post by Psychology Today. So now my question to you becomes, what do you want to create for yourself? Do you want to keep visualizing those “nightmare” scenarios where we imagine the absolute worst? Perhaps, instead, it’s time to try something new. If you agree, keep reading! 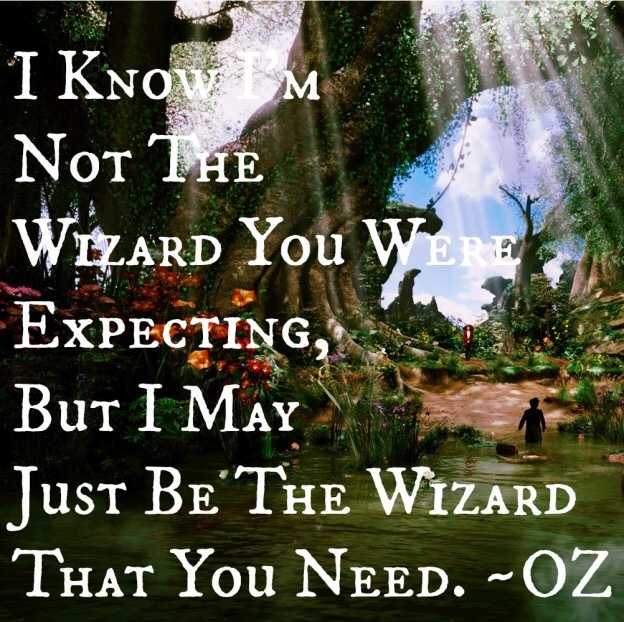 Doctor’s Orders: create one specific visualization of how you want your life to be different. Choose one aspect and focus on it for a week. Want to be more patient with your boss, coworker, self, client, spouse or kids, etc? Then see it, feel it, and become the more compassionate person you want to be. If you want to lose weight, then stop telling yourself you’re fat! Instead, visualize yourself and how you want to move and few with fewer pounds on your frame. Imagine as many details as you can. Do your best to keep it to one specific event, quality or thing and just keep seeing it, feeling it, breathing it, over and over! This is your GPS. To which address would you like to go? When we begin to see where we want to go, then we can start living it. Just be sure to clear out the mental “fear” clutter, too! That will just inhibit you. So go forth and imagine how you want your life to be (without worrying and creating nightmares) then start living as many aspects of the dream as you can today, now, ASAP! Sometimes we go through life completely unaware of some of our own inner mechanisms and motivations. In doing research for an upcoming certification exam, I discovered a research article that had discovered a correlation between women who have pelvic pain and who are insecurely attached. So naturally, my inner “armchair psychologist” wanted to know more. I took two online quizzes that confirmed for me that I am indeed insecurely attached. No, I did not really need to take the quizzes to know this about my attachment style. However, what I have discovered is that there are different types of attachment styles. Secure Attachments are ideal. When we are securely attached, we set and keep healty boundaries, we are able to engage socially and are accepting of our own and our partner’s individuality. We feel safe and do not fear becoming involved with others, nor of them abandoning us. Disorganized attachments are seen in adults who as children were given mixed signals by their parents. Children who cannot seem to do anything right in their parents’ eyes, who are criticized regardless of what they do, where children can never win. These adults then have difficulty with problem solving and both desire attachment as much as they fear it. I’ve written before about how I fear the very thing that I seek. The lover that I desire scares me as much as he intrigues me. In taking these quizzes and in looking over this information, I see more levels of myself that are needing attention. Each of these involve core and root chakra issues. They affect my feeling of deserving to be here and deserving to be loved. In seeing these aspects of myself, I also see how they have affected my ability to relate to men in the past few years. I have prematurely ended several developing relationships because of what I would now consider “Seinfeld” reasons (if you’ve seen Seinfeld you will know he always found something wrong with each woman he dated, excuses, I believe, to avoid intimacy). The past few days of introspection has opened my eyes to seeing how I fear being devastated again, as I was with the final years of marriage. Yes, I have grown in ways I never would have by remaining married. Yes, I am a more whole and complete person now in my own eyes, I no longer seek to be completed by a partner. Yet I am also finding that I seek for a lover less. Is it because I fear that intimacy, or is it because I now feel more complete and no longer believe I require a partner to feel whole? Hard to know. What I do know is that it is my desire for my attachment to my future partner to be secure at the highest level, with anxious, disorganized & avoidant at the lowest possible levels. Because you (meaning I) gotta have goals! Inside of each of us is a superhero waiting to be activated. It’s becoming more and more apparent that the planet needs us to stop playing small. Rise up, beautiful people. Fill your hearts with the golden light of love. Go forth and show others that this life is to be loved. It really doesn’t have to be so hard and violent. We’re in this mess together, we can choose to fix it or we can continue to be part of the problem. Give compassion to yourself and then don your armor. Together we can do far more than what none of us can do alone. Let’s cross this humbling river, so humanity can get to the other side of this B.S. What we need are more force multipliers. Superheroes, it’s time to rise up and assemble! The little things we do for or against ourselves add up. Listening to and shaking my hips to music while getting ready in the mornings has literally changed the course of my life. (Morning Playlist) Now I face each day with a new welcomeness and openness. It truly gives me a fresh start and an open heart. Writing even though I’m studying for the biggest test of my life, writing is like breathing to me now. The small things do add up, either for or against us. We each deserve our own love. The more we love ourselves, the more we can love others. So why keep hating & torturing yourself? Go forth and love you, even if it’s in small bits. Yesterday, I was basically describing how I felt unsafe being happy in Waiting for the Bottom to Fall Out? For so long my safety zone has been built on a platform of insecurity that “being okay” for more than a few days feels unsafe. Like many, I have struggled with being present as root chakra issues have been a common theme in my life. For so long I’ve been an escape artist, avoiding being present and feeling. For so long I’ve preferred to worry, plan, rush, rehash old memories and fantasize. All these cerebral activities have kept me from being present. They have kept me from truly feeling. The worst part? They keep me from healing and moving forward. Rehashing keeps us stuck in our stories and maintaining the status quo. While I have had many negative church experiences, my spirituality and faith is strong in what may seem a unique way so this may be a turning point for some who eschew religion altogether as well as those who are traditionalists. Daily and “in the moment” meditations such as this energy raising & Metta meditation help to keep me grounded. To move forward again, I offer up my pain to The Creator for transmutation. To do so, I must first believe that I am worthy of Divine assistance. Then I must ask for what I need help with (this took a long time to understand). Archangel Azrael helps with transformation and is a good one to call when someone needs help with transitioning or passing on. Archangel Michael assists with cord cutting, protection, speaking your truth and understanding your Divine Life Purpose. Archangel Uriel helps with being grounded and present, and also with Divine Life Purpose. Archangel Gabriel helps with dealing with strong emotions, especially when you fear you’re going to drown. Archangel Raphael opens the heart, heals the body, and helps to overcome addictions. Archangel Chamuel helps with opening the high heart, and sends compassionate love to others at your request. Quan Yin helps when compassion is needed, both for self and others. Mother Mary is helpful when nurturing is needed. Mary Magdalena helps with speaking and dealing with insecurities regarding your Divine Life Purpose. She also offers nurturing, yet with a calm force behind it. She reminds me of a wave, pushing one to the shore. Yeshua ben Yosef or Christ brings light that helps one to see in the darkness. These are just a few of The Creator’s helpers that are available to assist you, too. As humans have Free Will, Angels and Ascended Masters can only help if you call upon them and they can only assist in the ways you ask of them. Look at it this way, a plumber isn’t going to fix your roof, much less show up at your house uninvited. You are the contractor of your life. Divine Assistants are then your subcontractors. They can only help out when and where you ask. May we each find ourselves joyfully on the path that takes us out of our suffering. At a young age, I learned to suppress and filter my truth, in the process I also lost my youth. Even with my blog, I’ve held so much of myself back. Yesterday, I reached a turning point and am in the process of changing things a bit to become “unfiltered from the heart.” This was a domain I purchased some months back. Now I’m ready to take that next step and make it happen. I want to return to speaking my truth much as babes do, unfiltered and from the heart. So expect more changes as I make some course corrections. While I’m more lit up (in a positive way) now than I have ever been, I still can be more “grown up” and serious than I need to be. Still in “Type A” recovery. With each ounce of fear that I surrender into, I’m allowing myself to trust The Universe and God more and more, with the sweet innocence of a child. Yet with the budding wisdom of a woman in her mid-life. 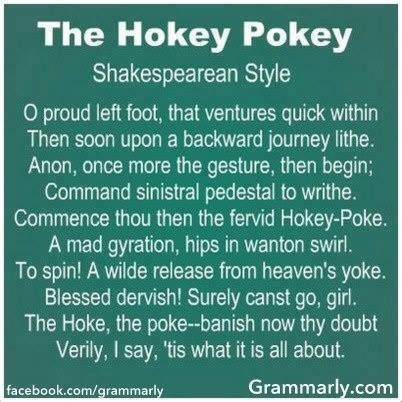 Now I’m leaving behind the Shakespearean version of the Hokie Pokie. Allowing things to fly, exposing some skin – allowing myself to feel okay in spite of my perceived sins. 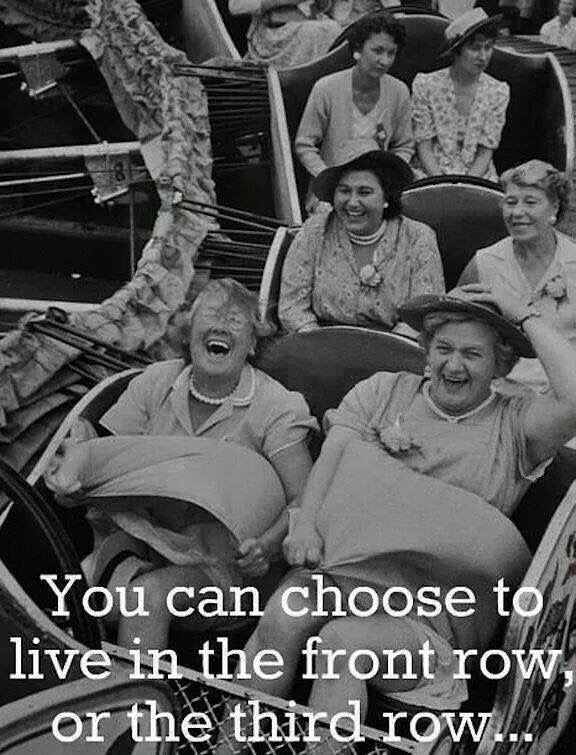 No longer desiring to take the safe roads, or be in the third row… Yes, the first row suits me! Thank you, Sir, may I have another? Dancing in the mornings as I get ready and make breakfast has been incredibly transformative! If you haven’t taken the time to play your favorite tunes during your morning routine, I highly recommend it. Your mind, soul and hips will thank you! Join me, I don’t want to leave you behind!